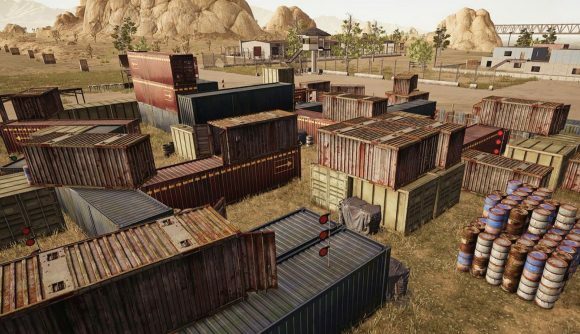 A firing range could be coming to PlayerUnknown’s Battlegrounds after a screenshot of a shipment yard was shared on social media by the game’s creator Brendan Greene. The screenshot was shared by PlayerUnknown ahead of his Gamescom slot, and features stacked red and green targets in a small shipping yard, as well as a firing range for long-distance shooting behind those. On the right of the image is the familiar sight of one of the game’s military camps, fitting in with the idea that the range is finally coming to the game. The firing range is a feature that has been in demand by the community for a long time, and if implemented, shows PUBG Corp’s continued efforts to work with players to develop the game going forward. PUBG’s popularity – even if it has dwindled in recent months – means that new features have to be added each month, and recently we’ve had a surge of new weapons, vehicles, and even a new map. The constant releases by the developer make it difficult to keep on top of the battle royale’s meta, so a shooting range where the game’s full arsenal can be tested is very much welcome. If what we’re seeing is the real deal, it also means we’ll no longer drop into Erangel, Miramar, or Sanhok completely blind. They say preparation is key, and there’s nothing worse than reaching a crate first, only to find it contains a gun you’ve never used before – hopefully this teaser image signals the end of that. We don’t know much about what Greene and the rest of PUBG Corp will reveal at Gamescom, but we do know that the focus is on fixing the game’s optimisation and making the chicken dinner experience better for everyone – and that’s something we can all get behind.